My experience of Japanese street food is that it’s not often very vegan-friendly (one day I’ll write a Tokyo travel post and tell you about some delicious exceptions to this rule: dango & sweet potato & anzu-ame). So I wasn’t expecting the Japan Day celebrations at Queen’s Wharf to be especially interesting in terms of food. 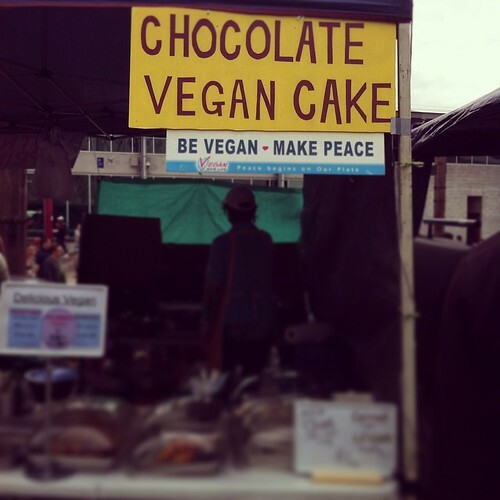 I was idly cruising the food stalls wondering if there might be some edamame or something, when I noticed a sign that said CHOCOLATE VEGAN CAKE. The sign belonged to a food stall that was all vegan, in fact. Its snack options included fresh or deep-fried spring rolls, wontons, crumbed tofu, samosas, noodle salads and two kinds of cake (lemon or chocolate). Run by followers of the Supreme Master Ching Hai (the movement that started the Loving Hut restaurant chain), the stall’s regular location is at Otara Flea Market every Saturday. 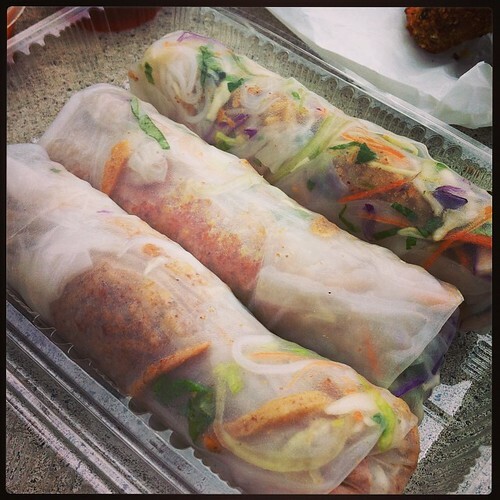 The stall had two kinds of Vietnamese summer rolls: I tried the fake chicken rolls with ground peanuts. They were generously-sized, stuffed with fresh filling and tasty. 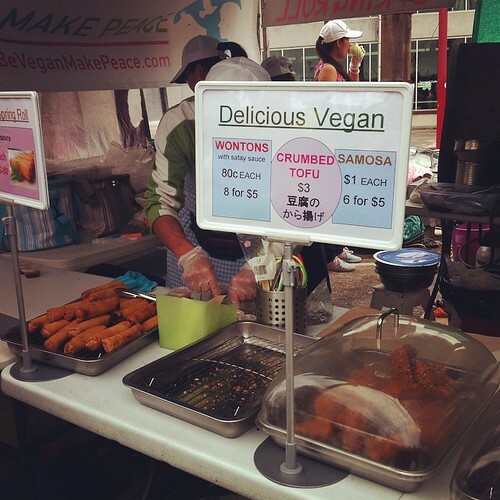 But my favourite thing was their crumbed, spiced, deep-fried tofu. It’s a bit of a repulsive comparison (and it’s been decades since I’ve eaten the original), but I wonder if this might be like a vegan version of KFC? 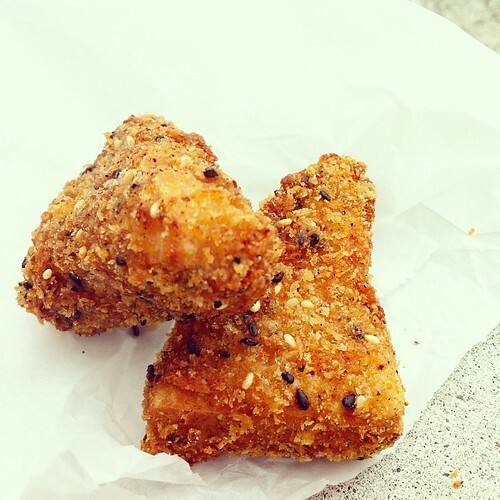 It consisted of thick slabs of firm tofu, coated in a golden, crunchy batter filled with a mixture of spices. Really good – I’d hunt these down again if I was anywhere near Otara Markets on a Saturday. As we were looking around inside Shed 10, another sign popped out at me: Lalele Organic boasted “ORGANIC COCOLATO: made from organic coconut milk, gelato-like texture with no dairy & no egg”. Frozen desserts made out of coconut are some of my favourite, so we stopped to check these out. 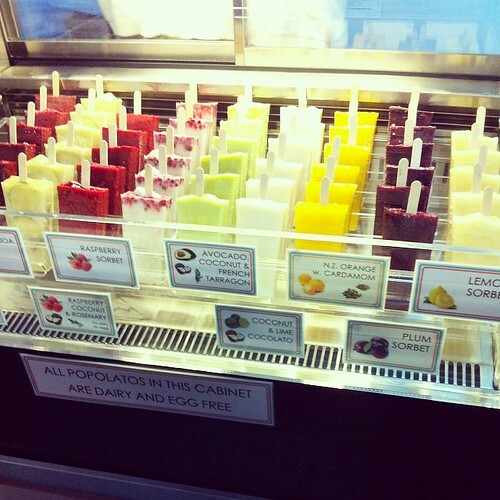 Lalele Organic’s range of desserts include a few flavours of coconut-based gelato, as well as organic fruit sorbet popsicles that are all dairy- and egg-free. They appear at other events and markets around the city (including Glenfield Night Market, Coatesville Market and Matakana Village Farmers Market), and they’ve recently opened a shop at Mairangi Bay (378 Beach Road, open 7 days from 10am-6pm). 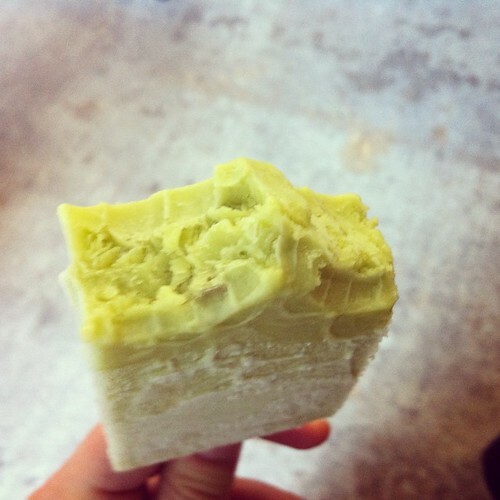 I tried a ‘popolato’ coconut gelato popsicle: avocado, coconut and french tarragon. It was beautifully creamy and rich, with a strong avocado flavour. I also tasted a bit of Erin’s plum sorbet popolato, which was tart and perfect. Several of the options in the cabinet looked appealing; the other dessert I’d been eyeing up was strawberry, coconut and lavender cocolato, and the feijoa popolato also looked amazing. I’ll need to find an excuse to visit the North Shore to try more of Lalele’s offerings.